You can live well, and even feel like you live luxuriously, if you just separate what marketing tells us is 'luxurious' as opposed to the things that really stand the test of time in the lives of the truly wealthy. 1. Monogramme or personalise household items. 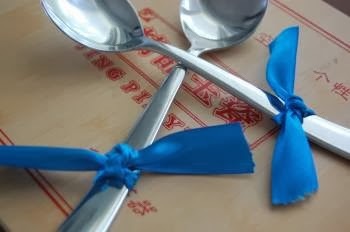 You can monogramme serviettes, pillowcases, handkerchiefs, or even personalised gift ribbon ordered online. A monogramme can be flowing script stitched in embroidery floss and fancy stitches, or block letters stitched in wool and running stitch and look equally effective. If embroidery is beyond you, look to stencilling or ordering ribbon printed with 'made by (insert your initials)' with which to tie your home made gifts. This in itself elevates home made to a whole new level. Etsy has many shops who offer this service. What about tearing an old floral sheet into strips and wrapping the lengths around wire coathangers before embellishing them with a big satin bow? Perfect for that special outfit, and non-slip to boot. 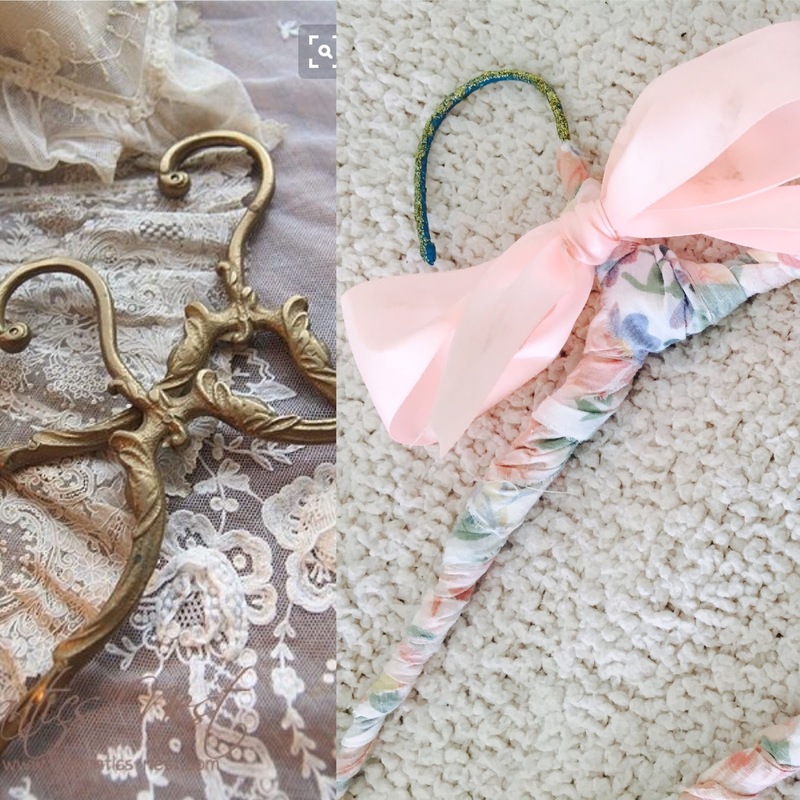 I love that these mimic the antique French hangers, shown left. A bit of pretty for almost nothing, and a gorgeous gift in a set of 4 or 6. I have an entire alphabet of monogrammes, downloaded from needlenthread.com, which is also a wonderful resource for learning to embroider. 2. Wear lovely lingerie. Yes even if you're 'of a certain age'. Why not? The pleasure of sliding into gorgeous lace trimmed undergarments should not be limited to the young. You don't imagine Lady Grantham of Downton Abbey slipping into stretch cotton over her industrial strength lycra, do you? 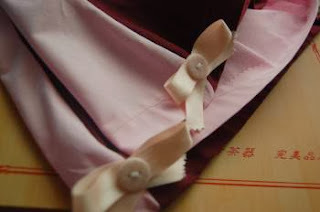 Lingerie is incredibly easy to make yourself, and whilst some of us might need more support, this doesn't have to mean that you can't at least trim those garments with something that makes them pleasurable to wear. 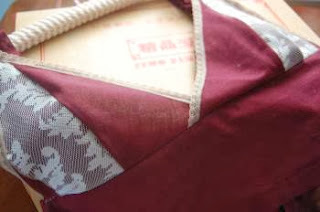 Here's my much viewed post on making lingerie from recycled sheets. 3. Support the Arts. Now you may not be into Ballet. We are, as The Diva has danced since the age of two. She also sings and acts, and is heavily involved in Community Theatre. So we actually have several opportunities to support the Arts in our city, without paying a fortune. But even if you're not arty, try local dance studio recitals, University, School and College showcases, and community theatre. These are a fabulous way to support up and coming talent, and pay far less than you would to see 'the big shows'. We're often pleasantly surprised at the standard too. Some have been better than 'the big shows'. True. 4. Eat lots of fresh, unprocessed food. Grow some if you can. Even a simple thing like mint and chives in a salad, adds something special to a meal. The rich and famous don't fill up on stodge. They are choosy, and will only eat the best. My Quinoa Salad is a perfect example. 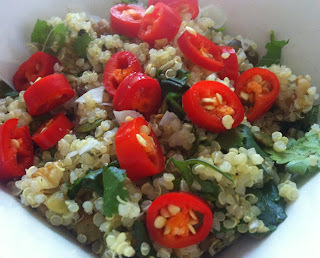 Quinoa steamed with vegetable stock, and tossed with chilli, coconut flakes, coriander (cilantro) and mint. Utterly delicious, and so fresh and light. 5. Make every meal beautiful. A simple thing like setting the table, and laying out utensils tied with slips of organza or satin ribbon, add an air of celebration to a meal. Remember when Sunday was always Roast Night? Why not reinstate a special weekly meal, be it lunch or dinner, and set the table with a theme. 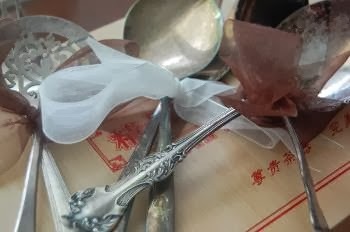 Tie the cutlery and serviettes together with twine and set it with rustic ironstone or mix and match cutlery, or drag out the heirloom china and beribbon your utensils. A checkered cloth and red glassware, a black and tan stripe with sunny yellow candlesticks, or fine linen and thrifted silver. It doesn't matter. What matters is that you make an effort. 6. Add a tassel here and there. I adore tassels and have started making my own. 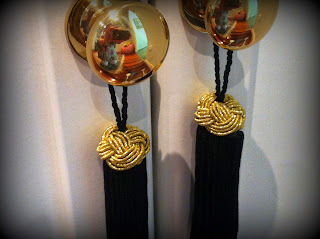 Little tassels on the doorknobs of the house, and the smaller knobs of furniture just make things look more lush. They can be silk floss, beaded, rustic calico and offcuts, or sequinned and embroidered. It's just such a lovely touch to reach to open a door, and brush your hand against something so gorgeous. A seemingly insignificant action, becomes luxurious in itself. 7. Always have a few special ingredients on hand to liven up a simple meal. 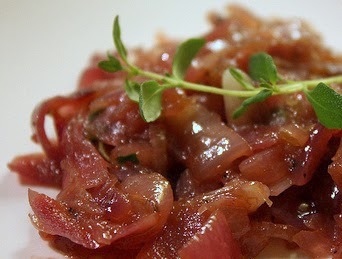 Having mentioned herbs, let's not forget things like a gorgeous relish or confit to add to a plain old burger or cheese sandwich, for a touch of five star. 8. Become a collector or a connoisseur. 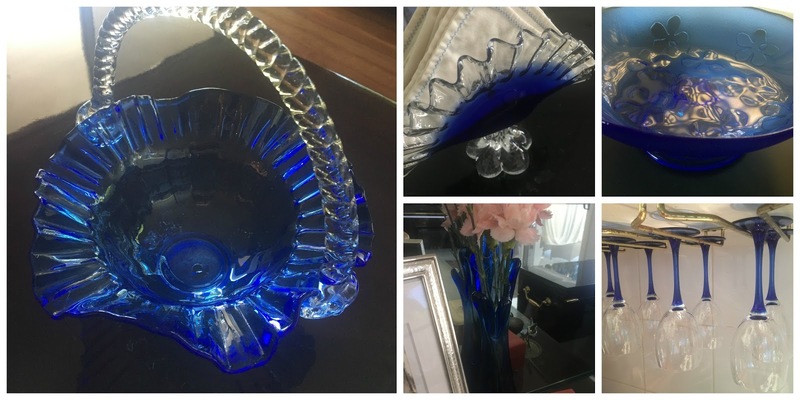 I collect cobalt blue glass. I have a few pretty pieces, collected over several years. I'm not obsessive about it, and in fact, I'm particularly choosy about what I buy. These pieces have been collected one by one over a period of time. The thrill of finding a match to a thrifted Kosta Boda bowl like the one top right, in a completely different location, 5 years apart, can't be beaten. My daughter collects cameos. She has one or two special inherited ones, and some that have been gifted to her. A few of those go back as far as when she chose them as treats over an outing when she was really little. Funny little thing she was. But who can complain about a child that wants a cameo over a trip to a theme park! The great thing about that too, is that when we were on our Meditteranean cruise, she did not waste money on insignificant touristy purchases. 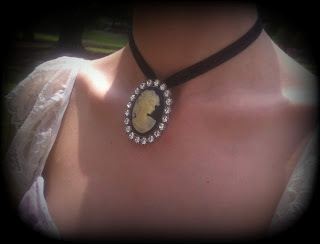 At the tender age of 15, she saved her hard earned money to buy a special cameo in Naples. I was really proud of her. 9. Commission a self portrait. Yes really! I don't mean asking the local noteworthy artist to paint your likeness. Ask your children (child or adult!) to do it. Or do it yourself. Photos are nice, but a painting is very special! A great way of doing this is to stand in front of a mirror, and trace the outline of some of your features with a dark creamy lipstick. Grab some blank paper, and press it onto the lipstick outline, rubbing firmly to transfer the image, then use that as your template for your portrait. Sometimes it's the things you leave out of your outline that make your portrait artworthy, so be restrained. The shape of your face, your eyebrows and one side of your nose, the upper lip, but just the middle of the lower lip, eyes and lids but not lashes, a few strands of hair. Frame it as is, or go wild with paint, pastels, or collage to turn your portrait into a work of art. Of course, children are a great source of artistic talent, and I have several portraits done by my children that are frame worthy. You probably do too. 10. Use the power of fragrance to make an impact. A simple thing like a signature hand wash or hand lotion can make a huge impression on people. We use a gorgeous Molton & Brown Naran Ji handwash here, and everyone, down to The Divas school friends, comments on it, and how lovely your hands smell after using it. I dilute it 1:5 in a foaming bottle, and each Molton Brown bottle lasts a whole year. Just as well at nearly $50! But we love it so much, and The Diva gets lovely comments all the time about how our home smells all Frenchy and yummy. I also use an Avon Vanilla Soy hand cream that The Diva and The Musician Husband both love to snuggle up to. You'll love the way your family and friends react, and even better how you'll feel, when you surround yourself with beautiful scents. What's your favourite way to live luxuriously for less? I love these ideas! That is a beautiful cameo. It's all about our attitudes isn't it! I love the monogramming! I do believe we were split at birth, Mimi!! =) So many things you write about in this lovely post resonate with me. One can always have a tassle or two or three......gracing one's home, a table dressed in a pretty tablecloth on which a pretty vintage plate sits alongside vintage cutlery, monogrammed linen, pretty silken undergarments...so many pretty everyday things we can do to bring a smile and a li'l joy to our day. These are the things that maketh one's day. In closing, the Quinoa recipe looks rather delish....I must try it. I have been eating a lot in front of the television - not good, I totally agree with you. I think it makes you impatient to cook and eat and not enjoy the food nearly as much! Mimi, I remember years ago reading about a family who were doing it tough and each night they would bring out their best crockery to eat dinner as they couldn't see the point in just keeping it shut away and brought out to use when company came. It cheered them up no end. Lovely post Mimi. Several things dear to my heart here. A couple for me are beautiful glassware and china as a day to day thing. I have amazing crystal glasses all from op shops and I use them for water, milk and wine! Breakfast, lunch and dinner. Same with cups and saucers. I read somewhere recently someone said they went out and were shocked they were served a cup of tea I a terrible mug. I related lol. Next is platters. I love platters! Serving a meal on a divine platter and letting people serve themselves... seems luxurious. NEXT beautiful generous sized hankies in fine cotton... and silk pillowcases and silk scarves. Mmm I seem to have many! Oh jugs ie large crystal or lovely shaped jugs for water or as vases. All somehow luxurious. Great ideas Mimi! It only takes a few little things to make you feel you live a luxurious life. I agree that fragrances make a house and you smell amazing and everyone notices. That hand soap must smell amazing for everyone to comment, might have to try and find some. Wonderful post and reminder to use those precious and special things that we have! Years ago I decided to go ahead and just use some gorgeous crystal drinking glasses because I enjoyed drinking out of pretty glasses rather than plastic cups. My husband still prefers the plastic ones because they hold more, but not me. One of my "weaknesses" is pretty scarves to wear. I inherited a few silk scarves from my grandmother and that started a lifelong love of them. I am so happy the cooler weather is now arriving so that I can wear my many silk, cashmere, soft wool and beautiful knitted scarves again. Most were found in thrift shops over the years and they just seem to elevate an otherwise casual outfit to a whole new level. You have a wonderful list of low cost luxury ideas! I think it is important to have some of those special things around the house. Why not spoil the ones you love and I agree that you can do it for a low cost if you think outside the box! Thanks for sharing with SYC. We all could use some luxury! Great tips! Thanks for sharing this at Home Sweet Home!